Central nervous system (CNS) involvement in multiple myeloma (MM) is rare (1%). Only few cases of MM presenting as an intracranial plasmacytoma had been described. In fact, the median interval from diagnosis to CNS involvement is 11 to 13 months. Isolated cranial neuropathies had been reported as symptoms of solitary clival plasmacytoma. Multiple cranial neuropathies had been reported in late stages of MM. ,, Very rarely multiple cranial nerves (CN) involvement by plasmacytoma may be presenting feature of MM. ,, Here, we report a case of multiple CN palsy (right 3 rd , 6 th , 9 th , 10 th and 12 th CNs) as first presentation of the intracranial plasmacytoma. 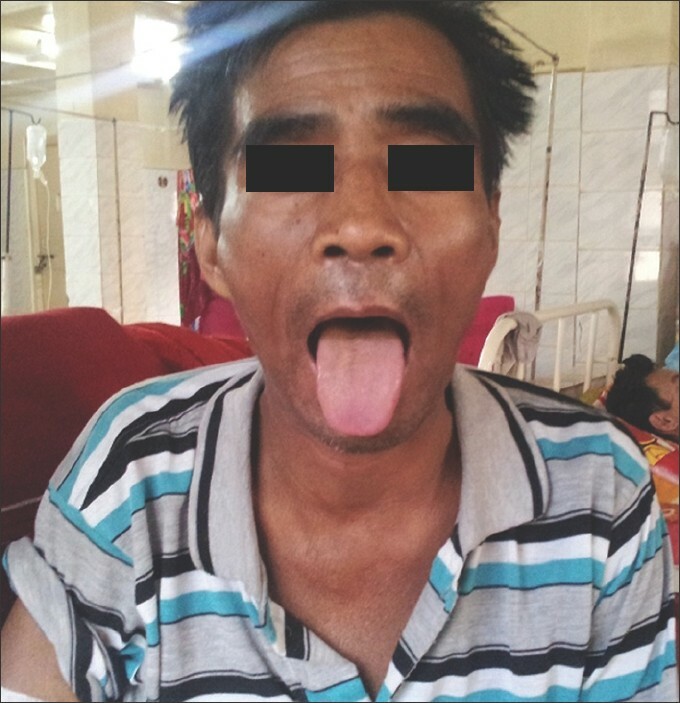 A 49-year-old male patient came with the complaints of daily headache, diplopia and recurrent fever with respiratory tract infections since 3 months; drooping of right upper eye lid, dysphagia and deviation of the tongue to the right side since 1 month. General physical examination showed mild pallor and swelling over the right sterno-clavicular joint [Figure 1]; bony tenderness was present over ribs and cervical spine. Neurological examination revealed right third (pupil sparing), 6 th , 9 th , 10 th , 12 th CN paresis were present [Figure 1]. Rest of examination was all normal. Blood routine examination showed hemoglobin of 9.2 g/dl, total leucocytes count of 17,790 cells/cu mm; neutrophil was 67% and lymphocyte was 30%. Erythrocyte sediment rate was 82 mm/1 st h. No abnormal cells are seen in peripheral smear. Urine routine examination was normal and urinary Bence-Jones proteins were absent. Blood chemistry showed serum creatinine of 4.3 mg/dl, urea of 131 mg/dl, serum calcium was 15.2 mg/dl and serum phosphorus was 5.9 mg/dl. Rheumatoid factor and antinuclear antibody were negative. Cerebrospinal fluid routine examination was normal with no malignant cells. X-ray skull and X-ray chest showed multiple punched out lesions [Figure 2]a and b. Computed tomography of the spine showed multiple punched out osteolytic lesions over the vertebral body-dorsal 6 th , 8 th , 10 th , and lumbar second [Figure 3]. Magnetic resonance imaging (MRI) brain showed an extra axial mass at the base of the skull measuring 3.5 × 2.3 cm involving the right side of clivus, dorsum sella, sphenoid, and right cavernous sinus causing the obliteration of cavernous sinus and its contents and extending up to right cerebellopontine angle, isointense in Tl- and T2-weighted images with gadolinium-diethylenetriamine pentaacetic enhancement [Figure 4]a and b. Bone marrow aspiration showed 58% plasma cells with a good number of binucleated forms and flame cells [Figure 5]a. Aspiration cytology of right sterno-clavicular joint swelling showed binucleated plasma cells suggestive of plasmacytoma [Figure 5]b. Serum electrophoresis showed presence of narrow and moderately intense band in gamma fraction suggestive of M-Spike. After reaching the diagnosis of MM with multiple plasmacytoma, patient was treated with thalidomide 200 mg/day and dexamethasone. After 1 month, patient showed improvement clinically [Figure 6]. Plasmacytoma may be intramedullary or extramedullary and primary or secondary to disseminated MM. Plasmacytoma and MM represent a spectrum of the same disease, where plasmacytoma refers to the localized disease and MM implies systemic dissemination. MM may show evidence of intracranial or orbital encroachment at any stage of myeloma, and occasionally this may be the first manifestation. This case presented to us initially with right 3 rd , 6 th , 9 th , 10 th and 12 th CN palsy, and subsequent investigation confirmed the diagnosis of plasmacytoma with MM. Among the neurologic complications in 277 myeloma patients studied by Silverstein and Doniger  Spinal cord compression was the most frequent 27 cases (9.7%), while CN involvement was unusual, that is, seven cases (2.5%) and it was the initial manifestation in only five patients (1.8%). Among these seven patients three patients had retro-orbital myeloma associated with proptosis; one had extra ocular movement abnormality, and other two had optic nerve involvement. One patient had 6 th CN palsy and other had 3 rd , 4 th and 6 th CNs palsy. The remaining two other patients had papilledema one of which was associated with 7 th and 12 CN palsy. Among the 25 proven, cases of myeloma with CN palsies collected by Clarke,  6 th CN was the most common, followed by 7 th , 8 th and 5 th CNs. The present case belongs to Group I of Clarke's clinical classification of myelomas. There are several cases of isolated cranial neuropathies as symptoms of solitary plasmacytoma. Multiple cranial neuropathies in combination such as Foster Kennedy syndrome, cavernous sinus syndrome, Gradenigo syndrome and jugular foramen syndrome had been reported in late stages of MM. ,, Multiple CNs involvements as the initial presentation for plasmacytoma had been reported very rarely only. ,,, Ko et al. 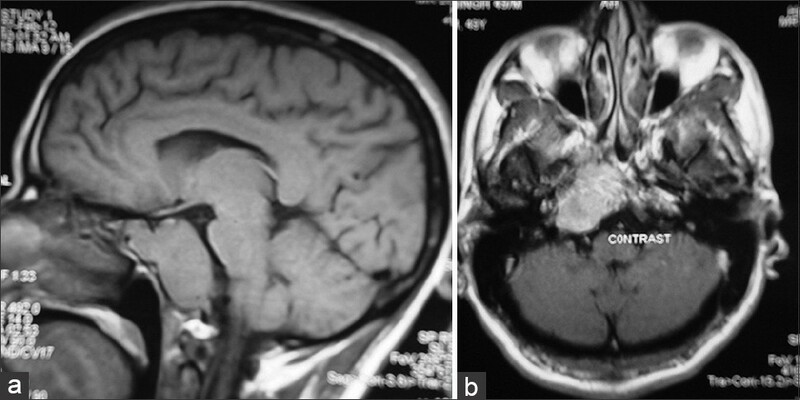 reported a case of the intracranial plasmacytoma in the cavernous sinus presented as left IV and partial V CN palsy. Doniger et al. had reported a case of plasmacytoma in spinoclival region with disseminated MM presented as third and fourth complete CN palsy. Tappin et al. reported a case of lower CN palsy in the form of Collet-Sicard syndrome, which turnout to be the intracranial plasmacytoma. Our case in-spite of being in stage III with multiple areas of spread/conversion to MM with deranged laboratory data, multiple cranial neuropathies with involvement of five nerves (3 rd , 6 th , 9 th , 10 th and 12 th ) was the initial presentation leading to the diagnosis. MRI study in this patient revealed a single plasmacytoma in the base of the skull causing obliteration of cavernous sinus and its contents extending up to right cerebellopontine angle. The extend of the lesion co-relate with our multiple CNs involvements. CN involvement is almost always due to direct compression of CNs by tumor arising from skull. When plasmacytoma appears at different locations in the context of MM, as in our case, the histological diagnosis of all these lesions is not needed. We are not certain whether plasmacytoma was the initial manifestation of MM or plasmacytoma progressing to MM. Both circumstances carry a worse prognosis  and it should be treated aggressively. To conclude, intracranial plasmacytoma is a rare manifestation of MM and multiple CN palsy can be the first presentation of MM. 1. Fassas AB, Muwalla F, Berryman T, Benramdane R, Joseph L, Anaissie E, et al. 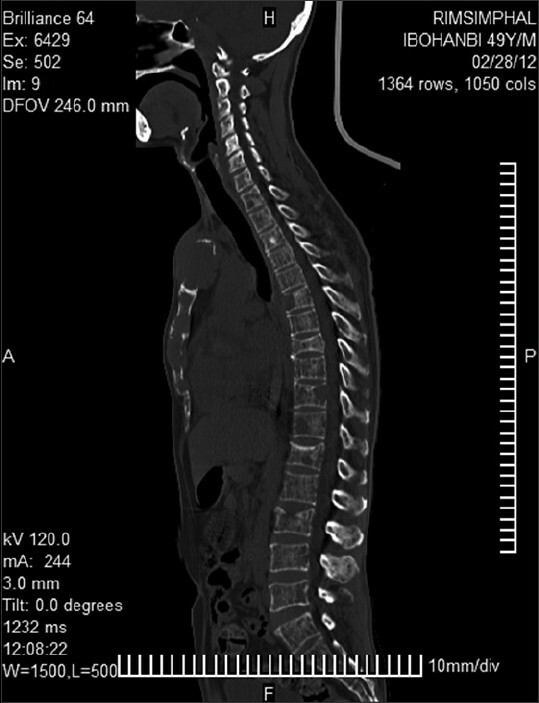 Myeloma of the central nervous system: Association with high-risk chromosomal abnormalities, plasmablastic morphology and extramedullary manifestations. Br J Haematol 2002;117:103-8. 2. Gagliardi F, Losa M, Boari N, Spina A, Reni M, Terreni MR, et al. Solitary clival plasmocytomas: Misleading clinical and radiological features of a rare pathology with a specific biological behaviour. Acta Neurochir (Wien) 2013;155:1849-56. 3. Morgan WK. Foster Kennedy syndrome produced by myelomatous deposits in the skull. Br Med J 1955;1:708. 4. Kyoda K, Nakamura S, Takeshima M, Matano S, Masuda S, Matsuda T, et al. Cavernous sinus syndrome associated with nonsecretory myeloma. Intern Med 1999;38:988-90. 5. Bourne RR, Maclaren RE. Intracranial plasmacytoma masquerading as Gradenigo's syndrome. Br J Ophthalmol 1998;82:458-9. 6. Ko S, Huang SY, Liu CY. Extramedullary plasmacytoma masquerading as Tolosa-Hunt syndrome: A case report. BMJ Case Rep 2009. 7. Montalban C, Martín-Aresti J, Patier JL, Millan JM, Cosio MG. Unusual cases in multiple myeloma and a dramatic response in metastatic lung cancer: Case 3. Intracranial plasmacytoma with cranial nerve neuropathy in multiple myeloma. J Clin Oncol 2005;23:233-5. 8. Tappin JA, Satchi G, Corless JA, Ashworth F. Multiple myeloma presenting as the Collet-Sicard syndrome. J Neurol Neurosurg Psychiatry 1996;60:14. 9. Silverstein A, Doniger DE. Neurological complications of myelomatosis. Arch Neurol 1963;9:102-12. 10. Clarke E. Cranial and intracranial myelomas. Brain 1954;77:61-81. 11. 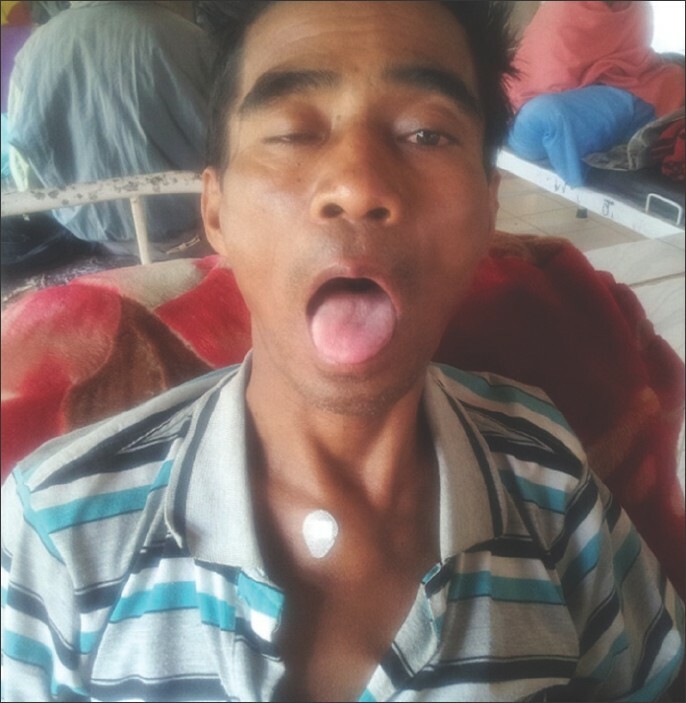 Kapoor J, Trinidade A, Mochloulis G, Mohamid W. Plasmacytoma of the atlas presenting as hoarseness: A rare cause of unilateral vocal fold palsy. J Laryngol Otol 2012;126:870-2. 12. International Myeloma Working Group. Criteria for the classification of monoclonal gammopathies, multiple myeloma and related disorders: A report of the International Myeloma Working Group. Br J Haematol 2003;121:749-57.